"A prime example of the power of storytelling. The Liar Show is a simple idea, brilliantly done"
"Andy Christie’s quirky Liar Show, a fixture at the Cornelia Street Cafe in Greenwich Village, draws a Halloween night booking this year, and Mr. Christie says that while the storytellers won’t specifically be confined to Halloween themes, the tales “will be in the spirit of Halloween — costume party disasters, scary situations, and one about a woman who drinks blood.” The format: four storytellers, three of them telling true personal tales, one lying; the audience tries to guess who the liar is. Terror rating: 4.1, because knowing you willingly paid money to be lied to is unsettling." 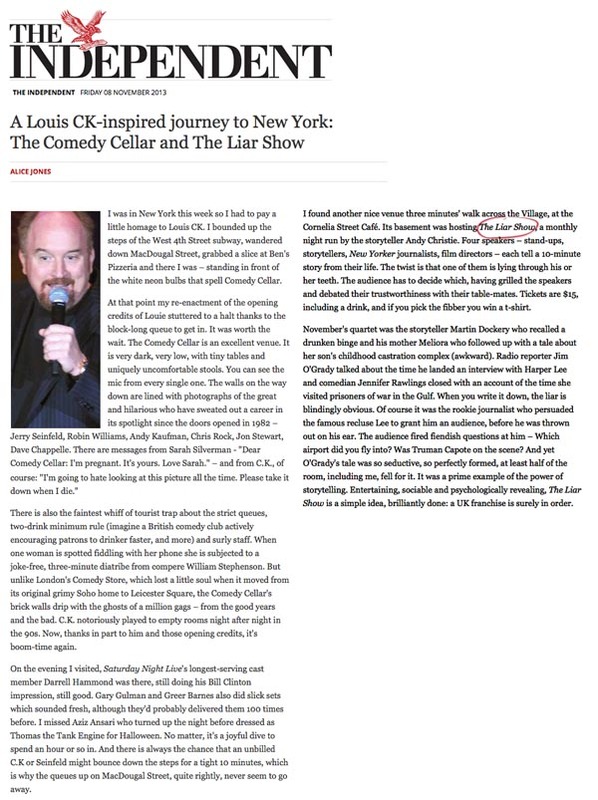 A mini Liar Show from the March 12, 2015 Brian Lehrer Show on WNYC. With Andy Christie, Jim O'Grady and Ophira Eisenberg. Followed by a March 13 recap with Jim and Brian discussing what nonfiction writers and journalists might find attractive about an opportunity to lie for fun. A TRUE story by Liar Show creator Andy Christie is included in The Moth's new book., which just landed on the N.Y Times Best Seler list. Buy it or listen to the story on The Moth Podcast. The concept is brilliant and flawlessly executed by Andy Christie." We're a WNBC TV/TimeOut NY "Best Bet"
They couldn't say it if it wasn't true. It's TV! "At turns moving, compelling and extremely funny." A TimeOut New York "CRITICS PICK"
"The show last night was FANTASTIC!!! I really can't wait to have you back as soon as we can!" "We love this kind of theater. While it entertains, it makes us think." "Thank you for delivering yet another fabulous show. I always love you and your band of storytellers"
"The Liar Show was a highlight of our season. Our audience members are still talking about it. Brilliant storytelling, and so much fun too!" "The show was great! I will definitely keep you guys in mind for next time." "A terrific event! Definitely one of the most fun events we've ever had."